Pizitz was a family-owned chain of department stores founded in 1899 in Birmingham by Louis Pizitz as the Louis Pizitz Dry Goods Company. It became one of the best-known names in local retailing until it was sold to McRae's in 1986. At its peak there were 13 Pizitz stores in operation; nine in Birmingham, two in Huntsville, and one each in Florence, Tuscaloosa and Montgomery. The flagship store was located in the 7-story Pizitz building, completed in 1925 at the store's original location at 2nd Avenue North and 19th Street. The first Tuscaloosa store was opened in 1913 by Max Pizitz and Joe Saks as part of the separate Pizitz of Tuscaloosa. Effective January 1, 1922 Joseph Smolian bought out Louis Pizitz' interest in the retail chain, which became known as the Pizitz-Smolian Co-Operative Stores Inc.
A fatal accident on one of the store's elevators resulted in a wrongful death lawsuit that reached the United States Supreme Court in 1927 to settle a point distinguishing punitive from compensatory damages in such cases. The company focused its merchandising on women's and children's clothing in 1930. When Max Pizitz died in 1943 his sons Sam and Isadore took over operation of the the business. In 1944 the store gave up its corner window for an American Red Cross "canteen", which offered free coffee and doughnuts to servicemen. Pizitz was sold to John S. Jemison and Associates in 1959. That year the new owners announced a $1 million project to modernize and improve the interiors at the flagship Birmingham store. The firm of Ketchum and Sharp Architects of New York was commissioned to design interior layouts, with Lawrence Whitten of Birmingham as their associate responsible for construction documents. Among the changes were electrical and air-conditioning upgrades, all new decorative fixtures, improved retail layouts (especially on the main floor, first floor and third floor) and a new fourth-floor auditorium capable of hosting events for up to 700. In 1964 Pizitz purchased the assets of Stuart's mens' store of Memphis, Tennessee. That same year display director Jim Dultz began a Christmas tradition of creating an "Enchanted Forest" in the 6th floor auditorium of the downtown Pizitz. Also during the 1960s Pizitz created a "Teen Board" of selected high school girls who modeled clothing and assisted shoppers in the juniors department. "Dolly Dale" was the name of the store's personal shopper program, which also handled telephoned orders for home delivery. The Pizitz parking deck was added next to the downtown store in 1965, with a skywalk that took shoppers into the store next to a bakery counter. 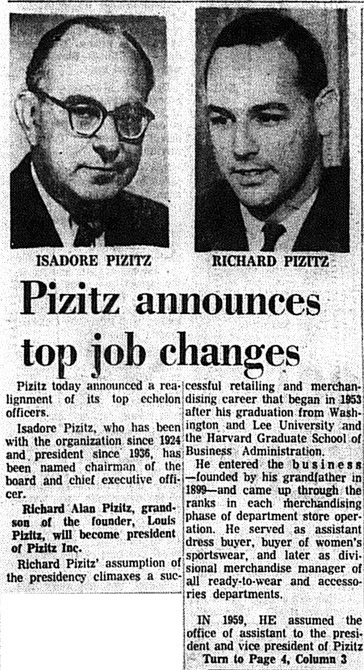 Isadore Pizitz was made chairman and CEO in February 1966, and was succeeded as president of the company by his son, Richard. On August 18 of that year, Pizitz opened a 100,000 square foot, $3 million anchor store on the east end of Eastwood Mall. With Pizitz and Aland's both joining at the same time, the mall became the largest in the Southeast. The addition was designed by Brandon Crawford of Fuller and Crawford architects and constructed by F. R. Hoar & Sons. In 1969 Dultz' successor, Jim Luker took over the design of the enchanted forest and refined it over the next 20 years. The last Enchanted Forest was constructed for the 1981 Christmas season. The chain was sold to Jackson, Mississippi based McRae's in 1986, though the Pizitz family retained ownership of many of the actual buildings. The downtown building was shuttered in 1988 while the other locations were converted to McRae's, which was later sold to Alcoa, Tennessee-based Proffitt's, which grew to absorb several other chains, including Saks Fifth Avenue, before moving to Birmingham and taking the name Saks, Inc. The McRae's stores were sold to Charlotte, North Carolina-based Belk, Inc. in 2005. Pizitz of Bessemer, operated independently at 1915-1921 2nd Avenue North Bessemer until August 1955, when it was brought into the Birmingham-based chain. In 1956 the new owners renovated and added air-conditioning throughout the store. It reopened on September 17 of that year. Logo used for the Tuscaloosa store to differentiate it with Pizitz of Tuscaloosa between 1980–81. Louis Pizitz Dry Goods Co. v. Weldell, 274 U.S. 112 (1927). Pizitz memories at Birmingham Rewound. This page was last modified on 4 February 2019, at 11:15.